Nigella Christmas. Wow, wow, WOW! I ordered Nigella's latest outing from from Amazon.co.uk and it arrived 2 days ago. (If I'd gotten it from Amazon.com the recipes would have had Imperial measurements, which my brain just cannot cope with). Needless to say, I am loving it. Nigella Christmas sees Nigella going down the coffee-table book route; it's a bit wider than her previous offerings, and is full of truly gorgeous photos (mostly of the food, but also of the lady herself), which are a lot more stylised than her usual. More than ever she places emphasis on table settings and decor - rare indeed is a picture without at least one bauble, or at least a healthy dash of Christmas red. It's totally OTT Christmas kitsch, and it's fantastic! Onto the recipes. Long-time fans and readers will recognise many staple Nigella recipes - the brined turkey, the roast potatoes, the evaporated-milk mac & cheese, the chocolate fruit cake. Of course, Christmas cooking is nothing if not repetitive and traditional, but the pictures, font and pretty-much-the-same-but-slightly-jiggled-around introductions make some recipes seem like they've been lifted straight out of Feast and plonked in this book. Tradition aside, the book did have many surprises - not least of which was an increased concern for vegetarians - butternut orzotto features on her Christmas lunch menu, and in more than one recipe she recommends leaving bacon as an optional extra so as not to be "unnecessarily antagonistic" towards vegetarian guests. She even has a whole vegetarian Christmas lunch menu, the centre of which is an enormous roast pumpkin stuffed with rice and served with gingery tomato sauce. I'm not sure how it would taste, but it certainly looks festive! In addition to the vegetarian alternative to The Turkey, Nigella provides Christmas Day menus for roast goose (oh yum! ), roast rib of beef and roast pork. I was surprised to see these menus, as in previous books I recall her writing that the traditional Christmas turkey was the only way to go (How to Eat), and if you're vegetarian you should either just skip the turkey, or eat your normal food on Christmas day (Feast). Booring! Top on my to-do list are the tiramisu layer cake (omg! ), the gorgeously golden fruit cake, the pumpkin and goat's cheese lasagne, the sticky gingerbread, the boozy British trifle and the fully loaded potato skins. (Just like my beloved German pizza brötchen, but with potato instead of bread). And you just know that I loved the look of that magnificent rib of beef. The first recipe I tried was the Spruced-Up Vanilla Cake. I made this yesterday, when one of my mum's friends popped in for coffee. It's a pretty simple butter cake, made all-in the processor, but its 'spruced-up' appearance comes from being baked in a super-festive Nordicware fir-shaped cake tin. 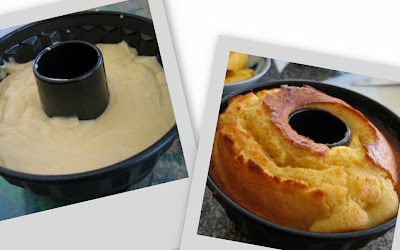 Nigella's recipe serves 12 and makes enough batter for a 2.5L bundt tin; I halved quantities and used my 16cm Kaiser mini bundt tin. This cake was just heavenly. It had the same vanilla fragrance and delightful crust of a Victoria sponge, but was more eggy, dense and moist, thanks to the addition of yoghurt in the batter. Nigella suggests serving it with a rhubarb and strawberry compote, or her antioxidant fruit salad (mangoes, pomegranate seeds and blueberries). I happened to have a ripe mango lying around and some frozen blueberries, so whipped up this summery accompaniment. (No pomegranates this time, but I think that the hard little seeds would have gotten in the way of the soft cake and fruits). So, Nigella fans. Who's got this book? Who wants this book? Opinions? Surprises? Any must-try recipes? Do you love or loathe the OTT red Christmas cheer decorations? I have it too... it's growing on me! Part of me thinks it's a bit naff (and those random kids - from the props department, haha! ), but then if you can't have naff and kitch at Christmas, then when can you? I don't like the cover much though... what was she thinking when she put that outfit together??!! I wasn't sure at first but now definitely loving it. I made the granola at the weekend and it is delicious so will be making more of that. I want to make the cake but thinking I should maybe buy a regular bundt tin rather than the once a year tin! I've got lots of recipes earmarked for trying this year. KJ - I love Nordicware tins! I used to drool over them when I worked at a kitchenware shop. Nickii - I think the tiramisu layer cake looks really, really good! And the fully loaded potato skins, omg! Norm - Haha, I think the outfit works in the context of the cover, (how festive!) but you're right, it's not her greatest ensemble! Only Nigella could make that combo look good. Gemma - I saw your granola on your blog, and it did look scrummy. Is it similar to the Fairfield Granola? I *love* that one!